Are you an outgoing, handmade loving leader? Or maybe a high school or college student looking for a fun, part-time gig? Well, we’re the spot for you! Come join our team! We’re looking for a Shift Manager to cover 3-4 shifts a week – evening and weekend availability is a must. We’re also in search of a Sales Associate to cover 12-15 hours a week, mostly on the weekends (hey students!). If you’re interested, stop in with your resume and fill out an application in store! We can’t wait to meet you! 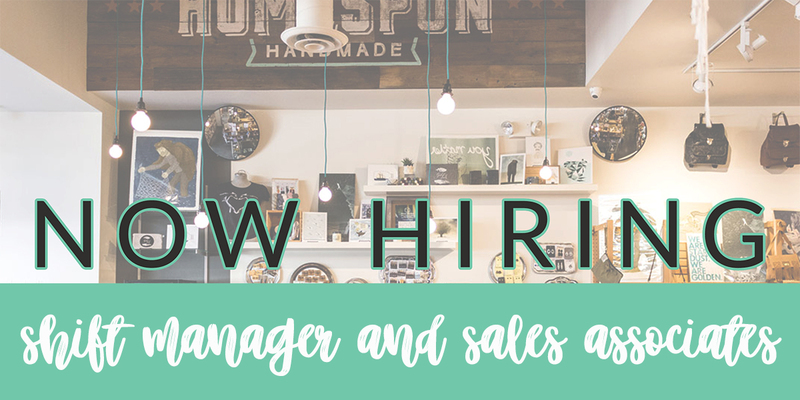 We’re currently accepting applications for a near-full-time Shift Manager and a part-time Sales Associate! Must possess a positive, outgoing attitude, excellent leadership and customer service skills, and must love all things handmade! The Shift Manager position requires 30-36 hours per week and evening and weekend availability. If you feel like you may be a good fit for this position, please stop in to fill out an application and leave your resume with our staff! Must possess a positive, outgoing attitude, initiative and determination to complete tasks, excellent customer service skills, and must love all things handmade! The part-time Sales Associate position requires 15-20 hours per week and evening and weekend availability. If you feel like you may be a good fit for this position, please stop in to fill out an application and leave your resume with our staff! When you work with us, you have the opportunity to work with a great group of individuals passionate about art, the local community, and all things handmade. You will also have the chance to work events, on-site and off, have access to free employee parking, and work in an inviting and creative environment! We are often crafting or creating displays in store! 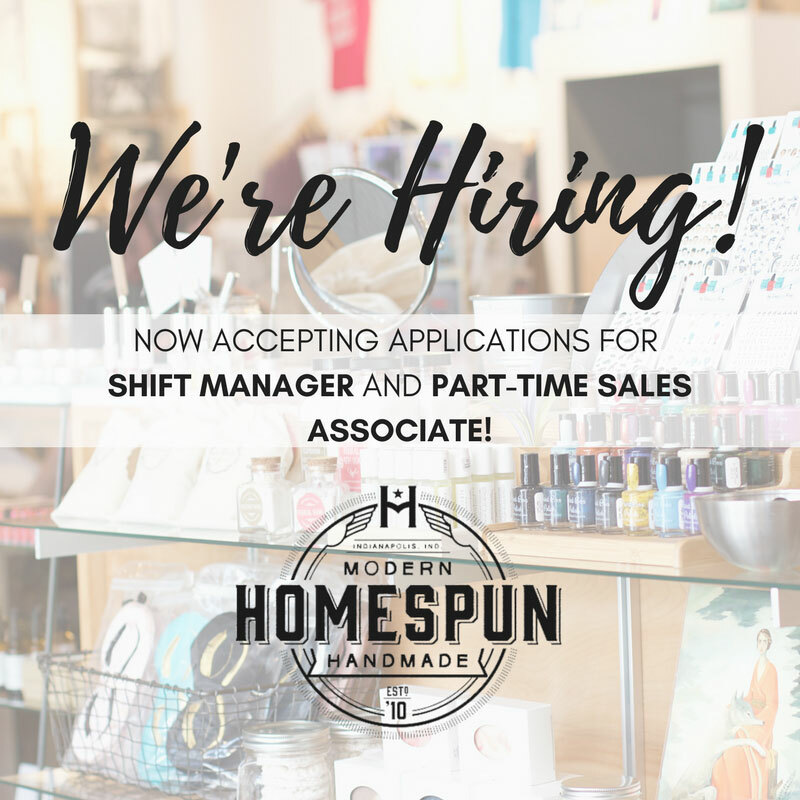 We hope that you’ll consider working with us at Homespun! 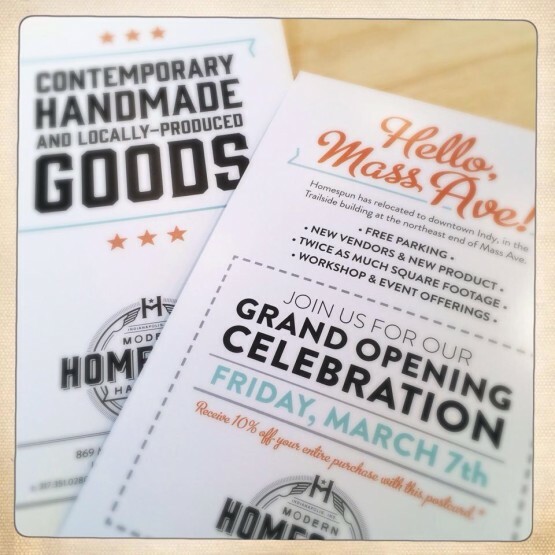 The Homespun: Modern Handmade Grand Re-Opening party is this coming Friday evening, March 7th, from 5-10pm. Come check out the new space at 869 Mass Ave, hear some lovely music from D. Mark & Jules, enjoy free samples from some of our food and beverage artisans, and see samples from some of our workshop teachers. Free and family-friendly! The main event will be Friday evening, but we will have fun and exciting things happening in the shop all weekend to extend the festivities. Keep an eye out at other small, independent businesses around town in the next week to pick up one of our Grand Re-Opening postcards with a 10% off coupon on the back, valid only during our Grand Re-Opening weekend, 3.7 – 3.9. Here ye, here ye it is by royal decree that we shall open our doors for business tomorrow, Saturday, February 1, 2014. It has been a long and hectic journey, but we finally see the light at the end of the tunnel. Our fixtures are in place, shelves are being mounted, floors mopped and hopefully soon we will begin to arrange our wonderful displays featuring our amazing artists. 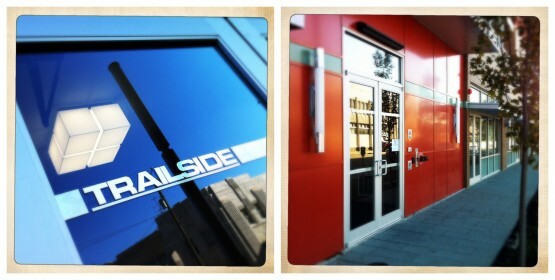 Come in and see our progress and don’t forget to join us for our Grand Opening celebration Friday, March 7! We’re making a big move in 2014! It would seem that we like to tackle big projects in pairs. We opened Homespun in Irvington in July of 2010 and two months later, our son was born. Our daughter was born this October, and three months from now we’ll move to a new, larger location downtown on the east end of Mass Ave. The decision to move the shop was one of the most difficult and most complex we’ve ever made. As a family and as business partners, we’re rooted in Irvington. 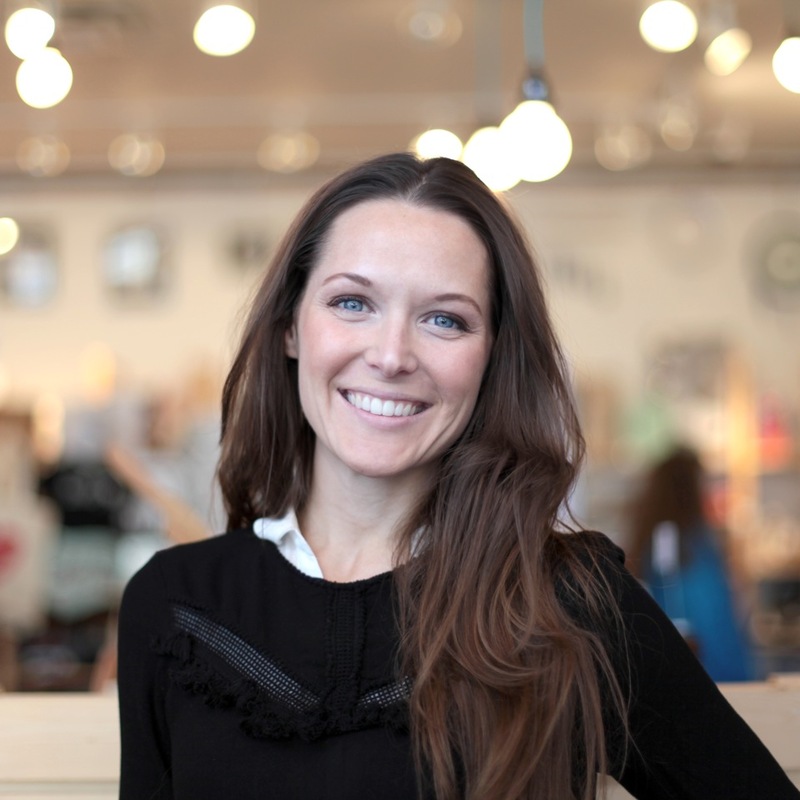 When we opened the doors of Homespun we set out to help make East Washington Street a shopping destination and to help strengthen the eastside business community. We’ve been well-supported by fellow business owners and neighborhood residents alike, and we are very appreciative of that. It is not something we will forget. However, as we’ve grown, we’ve run out of space: for in-store events, for sales floor display, for product overstock, even for employees’ coats. As much as we wanted to continue to grow our business in Irvington, we couldn’t find a suitable space to accommodate all of our needs. So, after many months of debate, we finally made the decision to relocate to 869 Massachusetts Avenue in February 2014. We’ll be just off of 10th Street, in the Trailside building, where Yats recently reopened, and a stone’s throw from Black Market, R Bistro, Indy Reads Books, The Best Chocolate In Town, Mass Ave Wine Shoppe, Crimson Tate and a number of other awesome businesses. (In early 2014, Natural Born Juicers will also join the block!) Homespun will double in size, allowing us to stock more of the best contemporary handmade goods and display them the way they deserve to be seen. The space will be more accessible for shoppers in wheel chairs and those pushing strollers, and our employees will finally have a designated space to eat their lunches and take proper – and much deserved – breaks! We’ll also be able to host workshops and maker demonstrations in the same space once again. We will be open for business seven days a week in Irvington through the holidays. We will simultaneously operate a preview shop on Mass Ave. on Fridays and Saturdays from Thanksgiving through the end of the year. The Washington Street location will close the final week of January and we’ll reopen on Mass Ave. in early February.